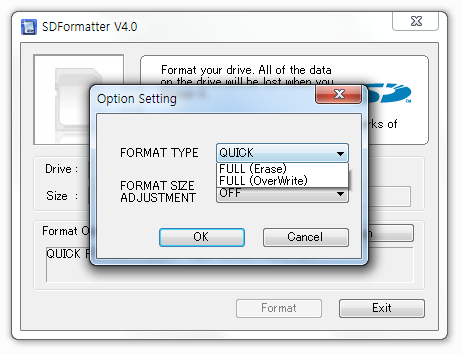 Format SD card using SD card Formatter software. The microSD cards in dashcams are submitted to a large number of writing cycles. In order to maintain optimal performance over time, it is recommended to use this dedicated SD Card Formatter, available for Mac OS and Windows PC. In case you have issues with your microSD card, we recommend to format it using this software rather than the formatting tools provided by default with your operating system. ​Go to https://www.sdcard.org/downloads/formatter_4/index.html and follow the instructions to download and install the program. 1. Plug the microSD card in your computer (you can use the BlackVue USB adapter for microSD card). 3. Please ensure that the Drive is pointing to the one belong to the memory card. 5. Select FULL (OverWrite) and press OK. (Comparing to QUICK Format, FULL OVERWRITE will take a longer time to format the card but this will ensure proper full formatting). 7. If you are using memory card (64GB or above), you need to format the card using the BlackVue Viewer software before inserting to BlackVue dashcam. This is to change the format to FAT32. Procedure can be found here.